A subway train rattles halfway into Manhattan's Union Square station and shudders to a halt. Over a crackle of static, a voice on the PA system announces congestion ahead and says it will be several minutes before service resumes. Trapped commuters sigh and glance at their watches impatiently. Some simply close their eyes in resignation. This sort of thing - and much worse - has been happening quite a lot lately. Entire subway lines have recently been knocked out for hours on end by failing equipment, including decades-old switches short-circuited by flooding. So it's no surprise that commuters are greeting with ambivalence this month's launch of fully automated trains on a 24-station line connecting Manhattan and Brooklyn. L line trains will run without conductors, except in emergencies, coasting along at preordained speeds and stopping automatically at stations, a lone train operator in the front car watching the controls. San Francisco has had this technology for years, and Paris has one such line. But the New York City Transit upgrade is a milestone. Never has a city with a subway so large or so old - it turned 100 last fall - tried to convert its existing infrastructure to automation. If all goes well, automation will be phased in on other lines over the next 20 years, and conductors will be phased out. 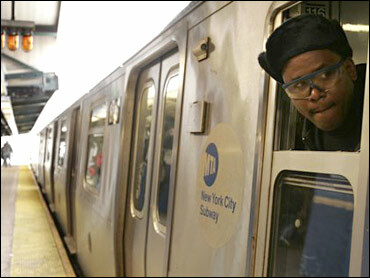 "We're moving from a 19th-century subway system," said Charles Seaton, a transit spokesman. "It's making the system more efficient, safer and allowing us to run more trains." The new technology is not without its critics, worried about safety. Nor has it been fast or cheap. Studies on how to convert the L line began nearly 15 years ago, and more than $250 million has been spent so far on upgrading the L, chosen partly because it's among the shortest and doesn't share track with other lines. If the program proves a success, it could take decades to implement the technology citywide. Nabile Ghaly, NYC Transit's chief signal engineer, said the new system lets traffic controllers know exactly where each train is at all times, and it tightly controls train speed. With it, trains can run more closely together - and therefore more frequently - and with fewer accidents, transit officials say. The new system uses "communications-based train control," or CBTC. Computers on trains, alongside tracks in special enclosures and at a new control center monitor a train's location and speed via radio waves. As in the subway systems in Washington, D.C., and London, screens installed in stations will tell riders when the next train will arrive. Train operators can adjust speeds themselves, but a warning flashes if they exceed limits set for specific sections of track. If the operator ignores the warning, brakes clench and the train stops - a precaution meant to head off driver-based accidents. It was such an accident that first drove the city to try CBTC. In 1991, a motorman who had been drinking fell asleep at the controls of a speeding train. The train derailed, killing five people. Yet for all its promised benefits, the plan has met some resistance. Several city council members and Public Advocate Betsy Gotbaum have joined the train conductors' union in raising safety concerns. The union acknowledges that its opposition stems partly from the fact that 119 conductors will be made redundant in the first phase of the plan alone, while about 2,700 more could lose their jobs systemwide. Opponents worry that without conductors, evacuation in emergencies could be slow and disorderly, and train doors could close on passengers. Conductors typically ride in a middle car, checking to see that passengers get on and off trains safely and overseeing the safe opening and closing of doors. Transit officials counter that in the new system, doors won't be able to close and trains won't be able to depart a station if there's an obstruction. Opponents are also wary of a system that puts so much trust in computers and automated signals, which they fear could be vulnerable to malfunction or terrorists. "They're going to be sending signals via radio waves," said Councilman Lewis Fidler, a Democrat from Brooklyn. "I don't want to find out that someone hacks into the system and makes a train disappear and another train rams into it." Such a scenario is unlikely, said Tom Sullivan, an independent transit consultant with Transportation Systems Design in Oakland, Calif., who helped design the L-line upgrade. The data carried on radio waves are encrypted, so only an internal leak could compromise its security, he said. Though it's possible to jam the radio signal, he said, that would only make the train stop. Sullivan, who also helped develop an automated line for San Francisco Municipal Railway in the 1980s, said he knows of no serious problems from hacking or malfunction. He is more concerned that the piecemeal approach the city is now taking could mean technology becomes obsolete by the time new lines are upgraded in the future. Compounding the problem, several different companies currently manufacture CBTC equipment, and parts from one company are not compatible with another. To have a truly integrated system, the city would have to continue buying all its equipment from Siemens AG, effectively giving it a monopoly. "The challenge is to get the companies to build equipment that's compatible with each other, so different trains can run on different lines," Sullivan said. "You don't want a winner-take-all situation."